Meet the recently discovered Fruitadens haagarorum. 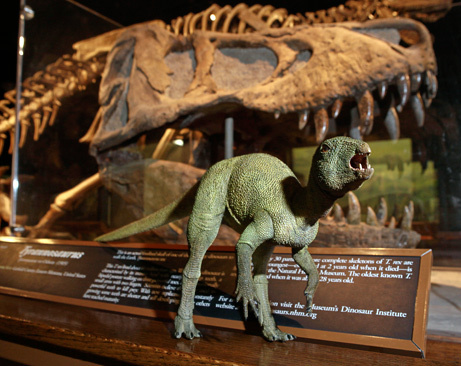 A teacup dinosaur that stood only 4 inches tall and weighed about as much as a guinea pig. Scientists say the little bugger would have been "like a roadrunner on steroids." Darting around at terrific speeds, running circles around much larger predators. So, mad scientists that are trying to make Michael Crichton's books become reality, clone this little guy. Come on, just do it. These mini-dinos would be the best selling pet in the world. Plus, we could race them. Tell me that wouldn't be the funnest thing in the history of ever. Miniature dinosaur races! Oh man, it's all I can think about. Please, scientists, get to work. I'll keep the cage clean and everything. I would name my pet Fruitadens haagarorum Jehosaphat. Me thinks this would end up badly. Johnny in little eaten pieces all over the floor. said Baierman on October 21, 2009 9:18 PM. I got one better for you JW....miniature dino races.....with monkey jockeys! said Bigus Dickus on October 22, 2009 7:29 AM. said Johnny Wright on October 22, 2009 1:05 PM.